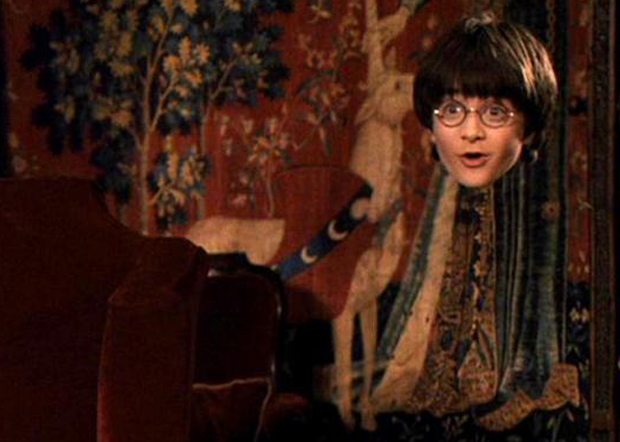 A miniature version of Harry Potter's invisibility cloak now exists, though it works only in microwave light, and not visible light, so far. Still, it's a nifty trick, and the physicists who've created the new cloak say it's a step closer to realizing the kind of invisibility cloak that could hide a person in broad daylight. The invention is made of a new kind of material called a metascreen, created from strips of copper tape attached to a flexible polycarbonate film. The copper strips are only 66 micrometers (66 millionths of a meter) thick, while the polycarbonate film is 100 micrometers thick, and the two are combined in a diagonal fishnet pattern. "When the scattered fields from the cloak and the object interfere, they cancel each other out and the overall effect is transparency and invisibility at all angles of observation," study co-author Andrea Alu, a physicist at the University of Texas at Austin, said in a statement. In lab tests, Alu and his colleagues successfully hid a 7-inch-long (18 centimeters) cylindrical rod from view in microwave light. They said the same technology should be able to cloak oddly shaped and asymmetrical objects, too. "The advantages of the mantle cloaking over existing techniques are its conformability, ease of manufacturing and improved bandwidth," Alu said. "We have shown that you don't need a bulk metamaterial to cancel the scattering from an object -- a simple patterned surface that is conformal to the object may be sufficient and, in many regards, even better than a bulk metamaterial." In principle, the same kind of cloak could be used to hide objects in the visible range of light, as well, though it may work only for teensy-tiny objects, at least at first. "In fact, metascreens are easier to realize at visible frequencies than bulk metamaterials and this concept could put us closer to a practical realization," Alu said. "However, the size of the objects that can be efficiently cloaked with this method scales with the wavelength of operation, so when applied to optical frequencies we may be able to efficiently stop the scattering of micrometer-sized objects." The invention isn't just a novelty to thrill Harry Potter fans and aspiring spies. The researchers say it could have practical applications down the line, such as in noninvasive sensing devices or in biomedical instruments. They described their device in a paper published in the March 26 issue of the New Journal of Physics.